The coat of arms of the Washington family was first used to identify the family in the 12th century, when the Washington family took possession of Washington Old Hall in County Durham, England. 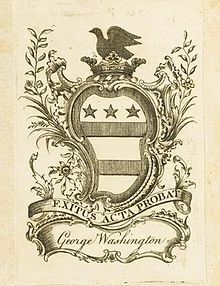 This coat of arms is the one that was used by George Washington, President of the United States of America from 1789 to 1797. 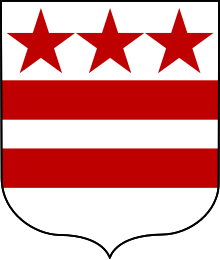 The design (three red stars over two horizontal red bars on a white field) is often said to have inspired the Stars and Stripes flag, and has been used since 1938 as the coat of arms and flag of the District of Columbia. It is also found on the Purple Heart. The notion that it inspired the design of the American flag dates to the celebratory and patriotic climate of the year 1877, which saw the publication of Washington: A Drama in Five Acts, a drama in verse by the popular English poet Martin Farquhar Tupper. In it, Benjamin Franklin proclaims that the design of the Stars and Stripes was based on the coat of arms of George Washington. "We, and not he—it was unknown to him," Franklin says, "took up his coat of arms, and multiplied and magnified it every way to this, our glorious national banner." The play was widely performed, and its message resonated with the American public. The story was repeated many times, including regularly in the popular children's magazine St. Nicholas. Undeniably the coat of arms does consist of two elements, the stars and the stripes, and a red and white coloration, but it lacks any blue coloration. Argent two bars Gules, in chief three mullets of the second. Some authorities in the twelfth century displayed the arms with the colours reversed (gules two bars argent, in chief three mullets of the second). An almost identical coat of arms was used by the Le Moyne family, who were described as landowners at Grafham in Huntingdonshire in the reign of Henry II. Their arms was: "Argent, two bars Sable, in chief three mullets of the second", with only the colour of the mullets and bars being different. The oldest surviving occurrence may be a stained glass window in the Old Library of Trinity College, Oxford. The window is believed to have been moved from what was the chapel of Durham College, Oxford. Durham College was created for the training of Benedictine monks from Durham Abbey. Durham College was disestablished by Henry VIII. Sir Thomas Pope purchased the site in 1555 and used it for the creation of Trinity College. An image of the window appears here. The Washington Window in Selby Abbey, in the British market town of Selby, contains a variant of the Washington coat of arms in the original 14th-century stained glass. It is thought to be a benefaction to the abbey to commemorate John Wessington, Prior of Durham (1416–1446). The arms are distinguished from the usual Washington arms by having pierced mullets. The Washington coat of arms can also be seen at the parish church in Garsdon, near Malmesbury, Wiltshire, where a branch of the family moved in Tudor times. A Washington memorial accompanies it. George Washington's coat of arms is engraved in stone in the porch of an ancient church in the tiny Dorset hamlet of Steeple, a church that incidentally lacks a steeple. The Washington coat of arms is also painted in scarlet on the roof interior, quartered with those of the squires of Steeple village, the Lawrence family, who are allied with the Washingtons by the marriage of one of its sons, Edmund Lawrence to Agnes de Wessington in 1390. The Washington coat of arms can be seen (with the colours reversed) on a memorial to John Wessington in the cloisters of Durham Cathedral, where he was Prior. The Washington coat of arms is engraved in stone in the parish church of Thrapston in Northamptonshire. George Washington's ancestor, Sir John Washington, was mayor of the town in the seventeenth century. The Washington coat of arms can be seen with many coat of arms in a stained glass window in St Laurence Church in Chorley, the same place where it is said to be the birthplace of Myles Standish. The Washington coat of arms can be seen in stone in the parish church of St John in Wickhamford, Worcestershire, on the grave of Penelope Washington, whose father, Colonel Henry Washington, was the first cousin of George Washington's grandfather Lawrence. The arms is lozenge-shaped, as is the custom for women in England. The Washington coat of arms can be seen in stone on the outside of Hylton Castle, Sunderland, an 11th-century fortified manor house. The Washington coat of arms appears in a memorial to Lawrence Washington (died 1619), great-uncle of Lawrence Washington, great-great grandfather of George Washington, in All Saints Church, Maidstone. The Washington coat of arms can be seen in a memorial window in All Saint's Church in Maldon, Essex, where Lawrence Washington is buried. The Washington coat of arms is engraved in stone on the tomb of the first Lawrence Washington (died 1619) in the chancel of Great Brington's parish church of St Mary. The Washington coat of arms is placed prominently above the entrance door at Sulgrave Manor in Northamptonshire, the home built in 1560 by Lawrence Washington (d. 1584) George Washington's direct ancestor. The family coat of arms can also seen in stained glass panels in the Great Hall which show marriage arms of several families that married into the Washington family. These are copies of the original stained glass windows, which were moved into the Church of St Mary the Virgin, Fawsley. The Washington coat of arms, quartered with that of Kitson, whose family married into that of Washington, can be seen in a stained glass window in Hengrave Hall in Suffolk. The Washington coat of arms appears with many other coats of arms in the main east stained glass window of St Martin's Church, Bowness-on-Windermere (Cumbria), in the fifth light from the left, on the top row. The Washington coat of arms appears in stone on the grave of a James Washington (d. 1580) in the north chapel of the parish church of Saint Laurence in Adwick-le-Street, South Yorkshire, where he was lord of the manor. However, there is no proved ancestral link between him and George Washington. Reverend Godfrey Washington, the great uncle of George Washington, who died on 28 September 1729 is buried in Little St Mary's Church, Cambridge. His memorial is on the north wall close to the main door. ^ "Grafham with East Perry - A History of the County of Huntingdon". british-history.ac.uk. Retrieved 4 February 2014. ^ New-York Life Insurance Co (1884). The Garsdon Branch of the Washington Family. Theo. L. De Vinne & Co. Retrieved 22 February 2015. ^ "All Saints, Garsdon". Woodbridge Group of Churches. Retrieved 22 February 2015. ^ "Steeple, Dorset, England". The Dorset Page. Retrieved 2 January 2014. ^ "St Oswald's Church Warton - The George Washington Connection". (official website). Retrieved 1 January 2014. ^ "St James's Church, Thrapston". British Listed Buildings. Retrieved 3 January 2014. ^ "The Church of St John The Baptist, Wickhamford" (PDF). badsey.net. Retrieved 2 January 2014. ^ "History and Research - Hylton Castle". English Heritage. Retrieved 2 January 2014. ^ "All Saint's With St Peter, Maldon - The Washington Window". (official website). Retrieved 1 January 2014. ^ "St Mary's Great Brington". (official website). Retrieved 2 January 2014. ^ "John Washington - Our Family Search". Our Family Search. Retrieved 25 December 2013. ^ "St Martin's Church Bowness-on-Windermere - Our Building". (official website). Retrieved 1 January 2014. ^ "St Laurence's Church, Adwick, History - The North Chapel". (official website). Retrieved 5 January 2014. ^ "St Laurence's Church, Adwick, History - The Washingtons". (official website). Retrieved 5 January 2014. 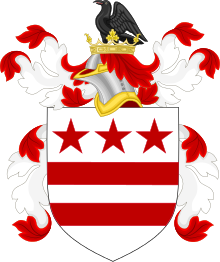 Wikimedia Commons has media related to Coat of arms of the Washington family. This page was last edited on 27 November 2018, at 21:28 (UTC).